amiibo Compatibility: Players can choose supported amiibo figures to be partners in online doubles matches, or players can enlist them to battle strong computer-controlled opponents in the offline Knockout Challenge mode. The more matches an amiibo plays, the more experience and skill it will gain. Currently available compatible amiibo include Mario, Luigi, Peach, Bowser, Yoshi, Yarn Yoshis, Rosalina, Wario, Toad and Donkey Kong. Knockout Challenge: Tense tiebreak matches against increasingly difficult computer-controlled opponents await in this single-player mode. If the going gets too tough, players can call in a compatible amiibo as a doubles partner. Mega Battle: After grabbing a Mega Mushroom, characters grow to gigantic proportions and can dominate the court with their increased power and range. 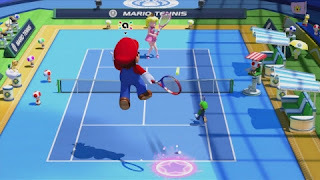 Classic Tennis: For those who prefer their tennis a little more traditional, Classic Tennis offers two variations: Standard mode features Chance Shots and Jump Shots but no Mega Mushrooms, while Simple puts competitors on the court with nothing but the net and the ball. Online Multiplayer: Go up against adversaries from around the world in competitive ranked play in either Mega Battle or Classic Tennis modes, or quickly jump into more casual matches. Two players* on the same console can team up to take on all comers, or a supported amiibo can join as a doubles partner on the online courts. Multiple Controller Options: Players can choose their favorite control option, as the game supports the Wii U GamePad, Wii Remote, Wii U Pro Controller and Classic Controller Pro options. For more information about Mario Tennis: Ultra Smash, visit http://mariotennis.nintendo.com.